The four text boxes in the lower right of this dialog box show the distances from the margin to the corresponding edge of the actual sheet of paper on which you will be printing. • .Left: This is the distance from the left edge of the physical sheet of paper to the left -Aedge of the print area. • Right: This appears as a solid vertical line in your window. You may have to scroll to the right to see it. In addition to marking the right edge of the printed area, the right margin serves as a wrap margin for all text regions. Don’t confuse the solid vertical line marking the right margin with the dashed vertical line marking the right page boundary. This line marks the right-hand edge of the sheet of paper itself. Its location depends on your choice of printer. If you haven’t chosen a printer, you won’t see this dashed line at all. • Top: This is the distance from the top edge of the physical sheet of paper to the top edge of the print area. If your worksheet has a header, it appears just above this margin. • Paper, Size: This should correspond to the size of the paper in your printer. • Paper, Source: This is the area in your printer supplying the paper. • Orientation, Portrait: The paper is positioned vertically, with the longest dimension running from top to bottom. • Orientation, Landscape: The paper is positioned horizontally, with the longest dimension running from left to right. This is useful if your worksheet is wider than a single page. 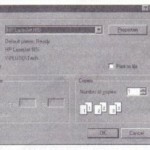 Click on the “Printer” button in the Page Setup dialog box to access your current printer settings. 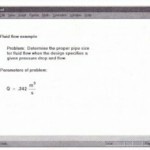 See “Printing” on page 79 for more about printing your Mathcad worksheets. 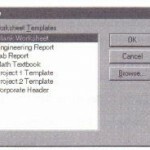 If you want the margin and other page setup settings in the current worksheet to be used in other worksheets, save the worksheet as a template as discussed in “Worksheets and templates” on page 72. 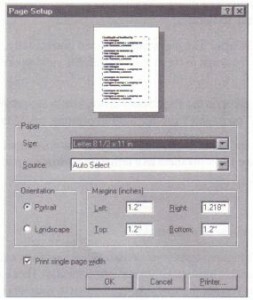 • Soft pagebreaks: Mathcad uses your default printer settings and your top and bottom margins to insert these pagebreaks automatically. These show up as dotted horizontal lines, and you see them as you scroll down in your worksheet. You cannot add or remove soft pagebreaks. 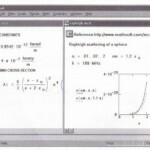 • Drag-select the hard pagebreak as you would select any other region in your Mathcad worksheet. 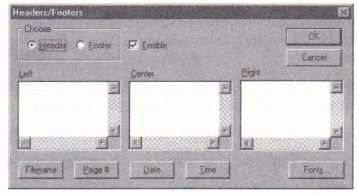 A dashed selection box appears around the pagebreak. • Choose Cut or Delete from the Edit menu. • Click on the Header radio button. • Type the header into one or more of the text boxes. Whatever you type into the Left, Center, and Right text boxes will appear left-justified, centered, and right-justified on the page respectively. always begins numbering at page 1. • Follow the rest of the instructions for inserting headers.